This knowledge platform for research and scholarly output has been selected and deposited based on its relevance to early childhood development, social cohesion, violence prevention and peace promotion, and more. Research and scholarly output included here has been selected and deposited based on its key relevance to early childhood development, social cohesion, violence prevention and peace promotion, and more. Blog "First Steps for Peace"
ECPC blog, “First Steps for Peace”, features global experts, including youth leaders, who share their knowledge and experience on topics relevant to violence prevention and peace promotion through the transformative power of early childhood development. The ECPC “Pathways to Peace” podcast series features discussions with global experts who share knowledge and experience on current topics, relevant to violence prevention and peace promotion through the transformative power of early childhood development. 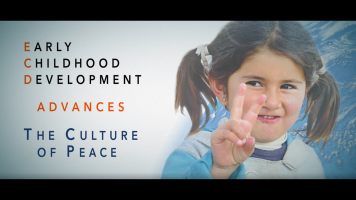 This video gallery features global experts who share knowledge and experience on topics relevant to violence prevention and peace promotion through the transformative power of early childhood development. This webinar gallery features global experts who share their knowledge and experience on current topics relevant to violence prevention and peace promotion through the transformative power of early childhood development. In this section, we provide an alphabetical list of terms with definitions that are relevant to this field of work.